Both the celebrations of the 25th anniversary of the fall of the Berlin Wall and the news about the apparent discovery of Queen Nefertiti’s tomb, awakened dormant memories of my visit to West Berlin, at the time when the reunification of Germany made headline news. With no intention to participate in this historic event and jubilate the fall of the communism’s symbol that divided it, I found myself doing exactly that. And as luck often bestow it upon us; I visited Germany at the right time. And while there, I traveled to West Berlin to answer the call of Queen Nefertiti, the royal resident of the city. Ludwig Borchardt, the German archeologist, abducted the bust of Nefertiti, the legendary queen of Egypt, from her home in Amarna in 1912. Falling in love with her beauty, Borchardt misled Gustave Lefebvre, the chief antiquity inspector in Cairo, about the true value of the bust. And as a result, this priceless piece of artifact found its way out of Egypt and settled in Germany in 1913, in the private collection of Henri James Simon, the German entrepreneur who financed Borchardt excavations. She stayed in his custody until he donated his collection, to the Berlin Museum in 1920. Nefertiti remained concealed from the public until 1923. A year later, in 1924, she made her final move to Neues Museum and remained there until the beginning of WWII in 1939, when the authorities moved the artifacts from the museums in Berlin to secured shelters. With the escalation of the war, the Germans moved Nefertiti to a salt mine in Thuringia, and there, the American Army found her in 1945. 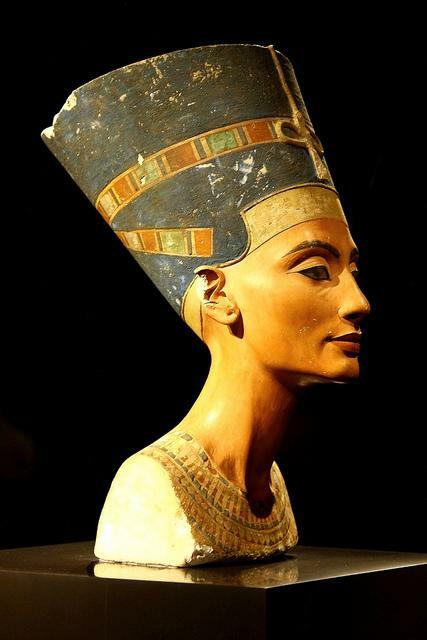 The long dispute between East and West Germany over the ownership of Nefertiti ended in 1956 when she settled in West Berlin. Fascinated by her beauty, inspired by the role she played in the history of ancient Egypt, and intrigued by her rise as the cultural symbol of the German capital, left me yearning to meet her. A business trip to Munich in 1990 made that dream come true. With no guarantee for my return, missing the opportunity to visit the Egyptian museum in Berlin, when I had a chance to, would have devastated me. It didn’t take me long to decide to travel the 700 km to Berlin, not to mention that traveling there also meant crossing into the DDR, a country that no longer exists. My desire to see her set me on an adventure, not of equal magnitude as her journey from Amarna to the capital of West Germany, of course, but one when remembered, proved that I made the right decision. I never visited Germany again. Restricting the speed on German highways defeats the purpose of building powerful engines, and thus the drive on the autobahn, with no speed limit, added an extra layer of excitement to my experience. And even with the little rain, the rented car flew from Munich to the GDR boarder in no time. I stopped at Hirschberg check point where a guard sat in a wooden Kiosk. The rain had stopped, but the cold temperature and the gray clouds reflected the gloomy surrounding. The guard, bundled in a long heavy army coat and a green military hat, with a machine gun strapped across his shoulder, walked out of the kiosk and approached the car, to inspect both of us, with his lifeless clear blue eyes. My first encounter with a communist filled me with apprehension, especially with the knowledge that the border guards often refused entry to whomever they wanted, for no apparent reason. I glared at him as he approached, while pretending to divert my gaze not to appear too obvious, as I compared him to the stereotype communist guards I watched in movies. My level of discomfort elevated after I surrendered my passport, driving license and car registration papers to him. With his poor English and my non-existent German, the communication between us hit a brick wall. And if he understood anything I said, he made no indication that he did. With a frown on his face, he mumbled in German – as he walked around the car to compare the license car number with the car registration form – as if my arrival interrupted his busy and important schedule. With no questions asked or an application to fill, he asked for 5.00 West German Deutsche Marks for a day trip visa. And to my relief, he stamped my passport and allowed me to drive through. Inside the GDR, travelers crossed the inner German border, built along the border between the two countries from the Baltic Sea in the North to Czechoslovakia in the south. To prevent East German citizens from defecting to the west, border guards secured the barb wires and the metal fences along the inner border around the clock. I crossed through and connected with the highway heading to West Berlin. The sudden transition transported me to a scene in an old movie. The green countryside in the Western section changed on both sides of the highway to pale, colorless and neglected fields. Bumpy roads replaced the silky asphalt and decades old heavy duty vehicles substituted the top of the art West German vehicles. Half way, I stopped at a rest area. The interior that smelled of boiled wurst and coffee looked as drab and gray as the exterior. I sat on a table covered with aged and stained tablecloth to drink my coffee, which its stale taste corresponded to the entire experience. The uneventful drive to reach Berlin dragged for 300 kilometers, and at Drewitz, the border guard inspected and stamped my passport, before crossing again from East Germany (GDR) back into West Berlin. Quite shameful how the division of the country decided the fate of its citizen, solely on where they resided at that time, and hence shaped their identities for 45 years. And while half of the population lived freely, decision makers forced the other half to live in suppression. Crossing the borders between East and West Germany underscored the regression and deterioration that had infested East Germany in the 45 years of communist rule. Nefertiti lived among the West Berliners within the concrete wall that surrounded the city. 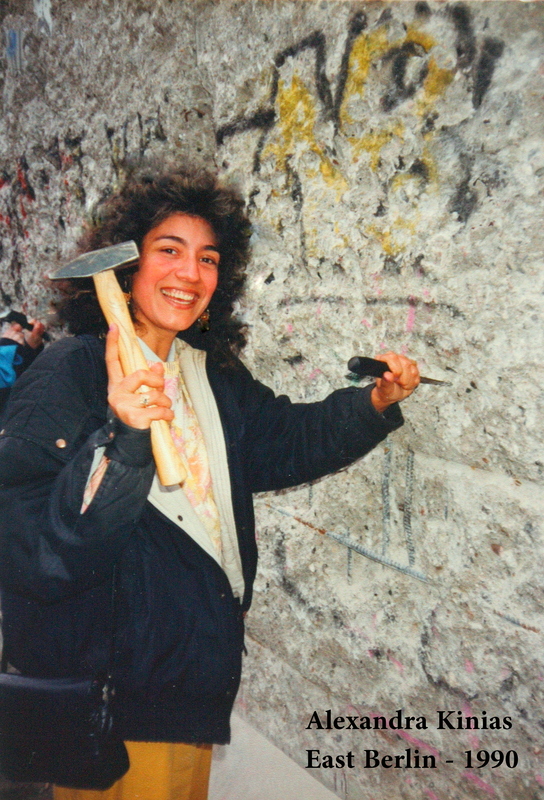 I walked around the wall that had once separated families, friends and loved ones, and watched locals and tourists chiseling off small pieces for souvenir. I chiseled some pieces for myself too. And inside the Egyptian Museum in Berlin we finally met. I stepped back in history as I walked into the black room where she majestically sat in her glass display. The light from a spot in the ceiling reflected its rays on her beauty and took my breath away. I stood in front of her speechless and my heart pounded in excitement. Mesmerized by her beauty I couldn’t avert my eyes off her for a while. I took some photos that were lost over the years, but it really doesn’t matter. Memories of such magnitude remain engraved in our memories forever. After all, who would have thought that the quest for Nefertiti would land me in Berlin to witness the event that reshaped the history of the 20th century? *In 2009, Nefertiti along the entire Egyptian collection was moved again to the Neues Museum in Berlin after its restoration.